The facial expressions are especially choice in this episode. Eeeeeeeeeeeeee! agreed. nightshade is not happy about being the middle member of the squishable stack in panel 1.
so,, did the expense of writing a quite humorous sidebar article finally get to the writers? OMG. those are mean looking dogs. 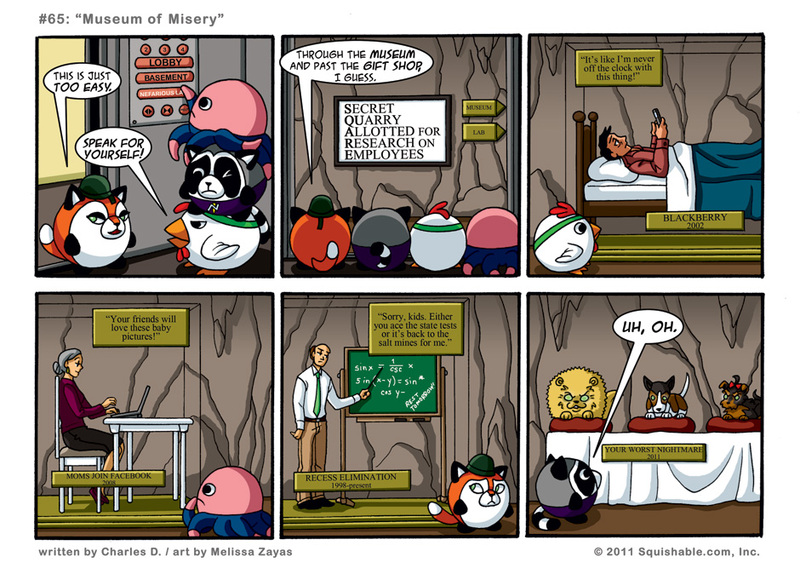 My reaction to Panel 2: Aww, cute little Squishable back sides… oh that just doesn’t sound right. So that’s the case? Quite a reveatioln that is. You’re right, though, Spirit & Nightshade have adorable little tails! i don’t even want to think of the horrors in the basement. or the wonders. Basements sometimes contain the opposite of what the company/person promotes/is like. OMG! In the fourth panel, the lady has a MIME eyes! How weird is that? When I’m on the computer, my eyes don’t turn into little plus signs.